Some more entries for VV in the Wild free t-shirt giveaway have arrived, and they're muy muchas fantasticos. 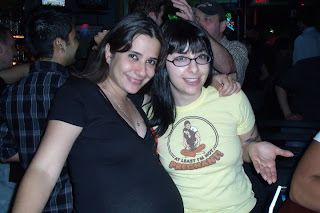 First up is Yevgenya and her fertile friend rejoicing in her (out of print) "At Least I'm Not Pregnant" t-shirt while partying down in Providence, RI. 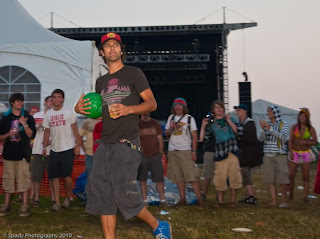 And next we have Ryan Stasik from Umphrey's McGee at Summer Camp music festival in Illinois last weekend. He is Sorry About Your Goldfish and happy about early morning kickball. Email James at vintagevantage at hotmail dot cahm to redeem your prizes! Mucha Mega 6-Way Throwdown - WINNER!